Guess what! My daughter got fantastic package in the mail!!!! “WOW, This is really for me? NEAT!” She said. 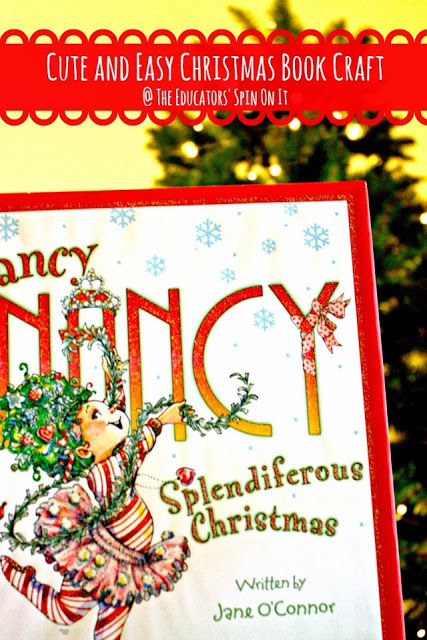 Thanks to Pen Pals & Picture Books, we received the book “Fancy Nancy Splendiferous Christmas,” written by Jane O’Conner and illustrated by Robin Preiss Glasser and a themed craft project to go with it! She snuggled up with it right away and we read it together. We have been talking about being able to make the best of situations and that holiday’s are stressful for some people. This book fit right in with what we have been talking about. That everyone makes mistakes. It is ok to be sad, but that we must not let ourselves become stressed over the simple mistakes and material things in our lives. We must make the best with what we have in life. I appreciate how Fancy Nancy was able to come up with a creative solution and have an enjoyable holiday! After reading the story, my daughter knew exactly what to do. “Can I make a tree topper just like Fancy Nancy?” “Of course,” was my reply! And so she used the materials in the package and some from our craft closet to create her tree topper. Let me just say that I think it is “Splendiferous!” Although Martha Stewart would like this last post, I am sure she would cringe at the sight of our tree at the moment. We even stuck unopened Christmas Cards in between branches so we wouldn’t lose them. =) Makes me happy just looking at it! As we were cleaning up, she asked if she could keep crafting and came up with a wreath to hang on the door handle or to use as a mask – isn’t she a hoot! THANK YOU Pen Pals & Picture Books for such a delightful package!!! Oooh! I love the wreath idea! Very nice and super creative! Martha would not be a fan of our tree either, but I love it! We have all the kids' holiday school projects stuck through out the branches and it just makes me smile! I'm so glad you guys loved the package!!! How fun! That looks great. We have this book too, but daughter never expressed any desire to make a tree topper like in the book. Of course it would be more fun for her to have all prep done, but I am too lazy for that. Elly did great!